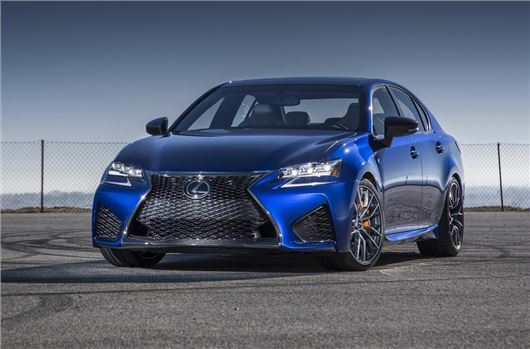 The high performance Lexus GS F can be seen in action for the first time at the 2015 Goodwood Festival Speed which takes place on the last weekend in June. Lexus has taken the usually hybrid-powered GS and fitted a 5.0-litre V8 producing 470PS along with 530Nm of torque. No performance details have been given yet, but we can expect a 0-62mph time of around than 4.5 seconds. Like the GS450h, there are four different driving modes, ranging from Eco to Sport S plus a special Sport S+ designed for track driving. The restrictions of the Goodwood hill mean the GS F won't be driven to extremes, but visitors will still be able t see a decent turn of speed and experience the noise of the V8. We're hoping the GS F is better than the new RC F - a car that promises much but sadly underwhelms. To make the GS F stand out from the standard GS, Lexus has given it a spindle grille with a mesh pattern, similar to the one seen on the new Lexus NX. There are front air vents and 19-inch wheels as standard along with a carbon fibre spoiler and chrome exhausts. Inside there's an electronic instrument display and bespoke front and rear seats with extra side support. There's Alcantara trim on the centre console and dash while a 17-speaker Mark Levinson stereo system comes as standard. Details of the production version of the GS F will be announced later this year.